The performance of U.S. fifteen-year-olds in mathematics “fell significantly,” while science and reading performance was little changed since 2012, according to the latest results from the Programme for International Student Achievement (PISA), which were released this morning by the Organisation for Economic Co-operation and Development (OECD). 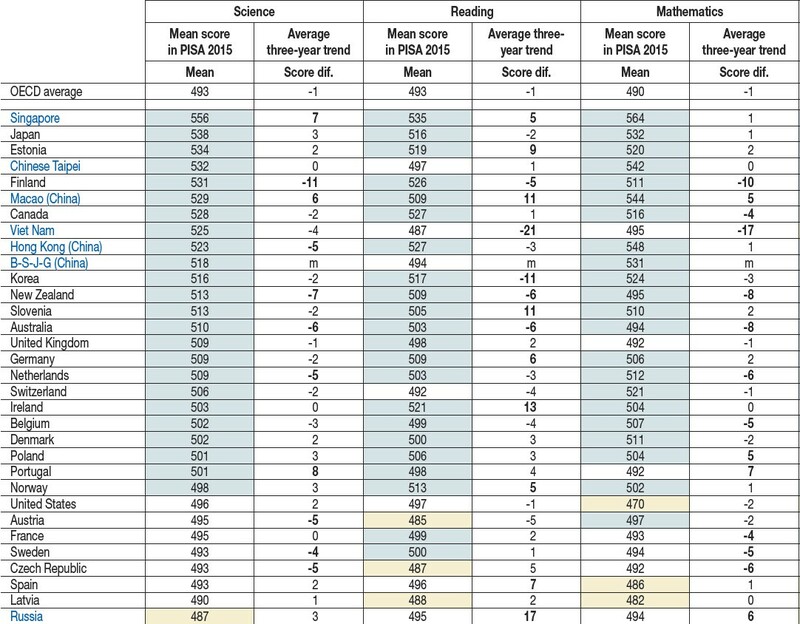 As shown in the table below, U.S. performance slipped by 1 percentage point in science and reading since 2012 but 11 percentage points in mathematics. Compared to students from the more than seventy countries and economies who took the test, American students performed around the international average in science and reading but below average in mathematics. Compared to the thirty-five countries in the OECD, the United States ranked nineteenth in science, twentieth in reading, and thirty-first in mathematics. The table below represents student performance of selected countries and economies on PISA. (Names listed in blue are partner countries and economies in PISA 2015.) Scores shaded in blue are above the OECD average, scores in white are equal to the OECD average, and scores in yellow are below the OECD average. For a complete list of the rankings, visit http://www.keepeek.com/Digital-Asset-Management/oecd/education/pisa-2015-results-volume-i_9789264266490-en#page46. 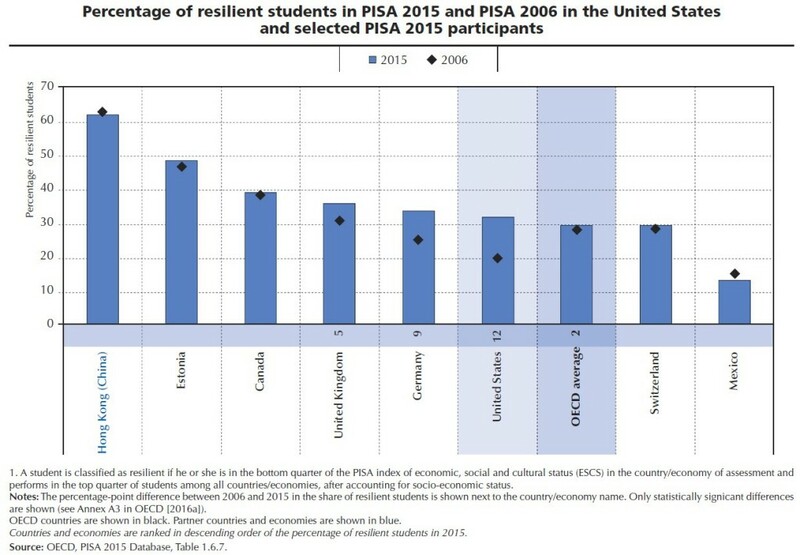 While the overall U.S. performance fell far behind top performers, such as Singapore, Japan, and Canada, the United States made the biggest improvement in equity from 2006 to 2015, increasing its percentage of “resilient students”—defined as disadvantaged students who perform better than predicted by their socioeconomic status—by 12 percentage points, as shown in the below image from the report. “Among OECD, there’s not a country that has been more successful in closing the socioeconomic gap than the United States,” Andreas Schleicher, director for education and skills and special advisor on education policy to the Secretary-General at the OECD, said to Education Week. American students also show more interest in science than their international peers, with 38 percent of fifteen-year-olds expecting to work in a science-related career at age thirty, compared to 24 percent of students internationally. A clear education strategy to improve performance and equity should be implemented. Rigorous and consistent standards should be applied across all classrooms. Teacher and school leader capacity should be improved. Resources should be distributed equitably across schools—preferentially to those schools and students that need them most. 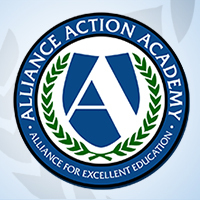 At-risk students and schools should be proactively targeted. In a column for the New York Times, Amanda Ripley, senior fellow at the Emerson Collective and author of Smartest Kids in the World, notes that the United States has implemented only one of these recommendations at scale—the college- and career-ready standards, including the Common Core State Standards, that have been adopted and implemented in every state. 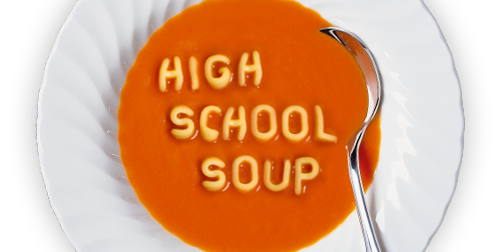 Ripley writes that Schleicher did not expect the new standards to boost America’s PISA scores because there were only in place for a year in many states, but Schleicher remains a believer. Key Findings from PISA 2015 for the United States is available at http://www.oecd.org/pisa/PISA-2015-United-States.pdf. 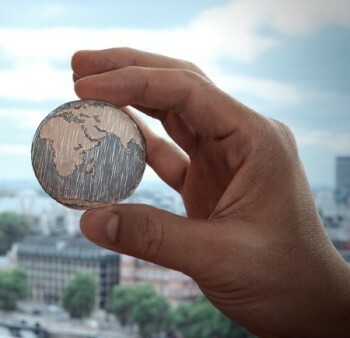 The thirty-five OECD countries are Australia, Austria, Belgium, Canada, Chile, Czech Republic, Denmark, Estonia, Finland, France, Germany, Greece, Hungary, Iceland, Ireland, Israel, Italy, Japan, Korea, Latvia, Luxembourg, Mexico, the Netherlands, New Zealand, Norway, Poland, Portugal, Slovak Republic, Slovenia, Spain, Sweden, Switzerland, Turkey, the United Kingdom, and the United States.